Without meaning to go for the obvious pun (honest! ), this weekend has the potential to be a wild one. Now that you're done booing me and throwing rotten vegetables (why did you even keep them?) there are four films with unusual pedigrees hitting wide release this weekend. 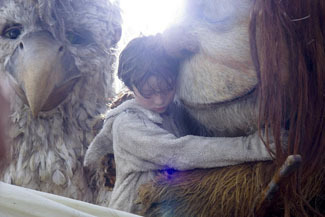 Where the Wild Things Are is one of the stranger candidates for a book to be adapted to the big screen that you can think of. A children's book that's all of about ten sentences long, it's all the same a beloved classic for its memorable art and sense of adventure. The book follows a young boy named Max as he ventures out into the night in a wolf costume and stumbles upon a group of monstrous-looking but well-intentioned beasts, with whom he dances through the night. War and Peace it ain't, plot-wise. However, Spike Jonze thinks he's seen something in the book, and he and Dave Eggers have turned it into a feature film with Jonze directing, in his first film since 2002. And hey, if there is any director out there that can turn just a germ of an idea into a workable concept it's Jonze, who's responsible for some of the crazier moments put to celluloid this side of David Lynch. Jonze and Eggers position the book as a paean to youth and lost opportunities, creating a fantasy world that incorporates the outlandish and the sublime. Some of this might be a bit heady for kids, though there's still the fantastic creature design to latch on to. It's the rare kids movie with a greater appeal to boomers and Gen Xers than the actual kids it's nominally targeted at, with nostalgia as the driving force.